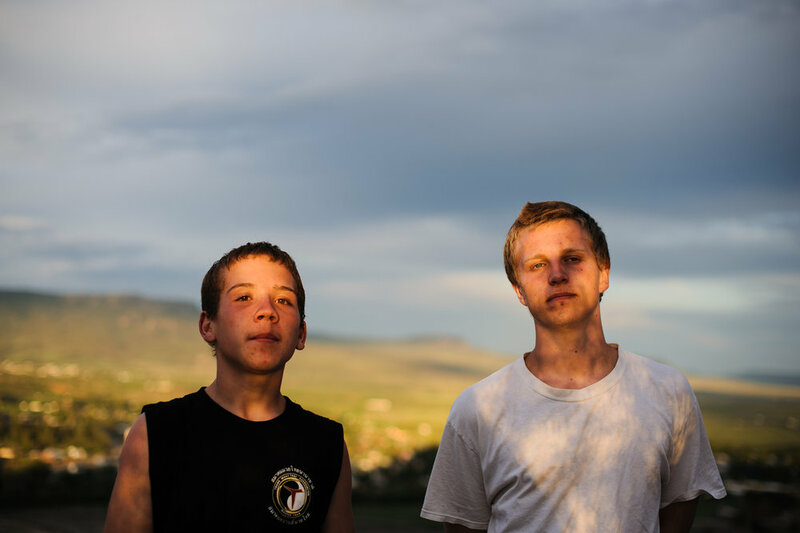 “Vinny and David” begins with Vinny, then 13, when he was incarcerated for stabbing his mother’s assailant, and shadows him and his older brother, David, age 19; the long-term photo essay focuses on the brothers’ lives in their family, community and respective incarcerations over six years in Albuquerque, New Mexico. The photo reportage also shadows their mother, Eve; her two younger children, Elysia and Michael; David’s ex-girlfriend, Felicia, their two children, Lily and Mary Jane; Vinny’s girlfriend, Krystle, and his daughter, Jordyn. In early 2012, I saw Vinny in the booking section of the juvenile detention center in Albuquerque. I soon learned that Vinny was incarcerated for stabbing the man who was assaulting his mom. 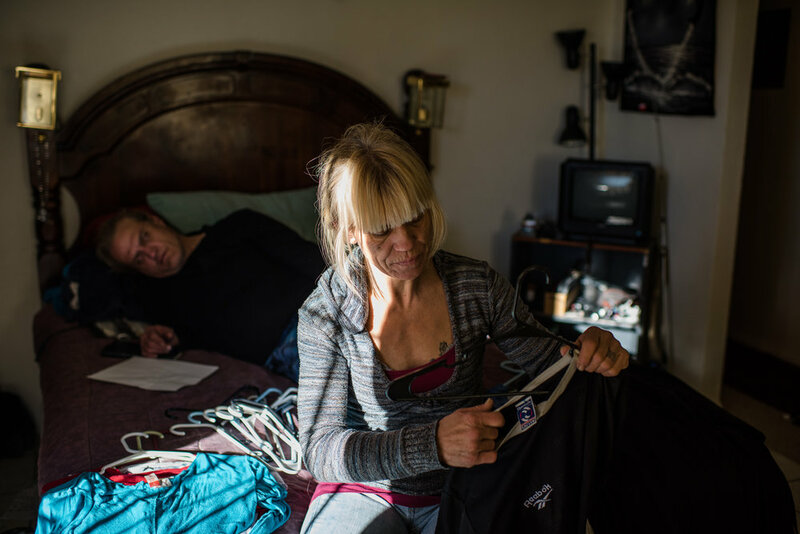 In the motel room where they lived, Vinny, age 13, was cutting food to make for his two younger siblings, Elysia and Michael, as Eve, their mom, argued with a family friend, Jessie, about borrowing $70 to bond her eldest son and Vinny’s brother out of jail. Jessie exploded in anger and began to beat Eve to the ground. “When my mom was being beat up,” Vinny says, “I didn’t know what to do. I am tired of seeing my mom get hurt.” In juvie, he was only able to visit with his mom. Sitting with him, he spoke continually about his brother, “my brother is a dope seller. He’s not good and not bad, I love my brother more than anything in the world.” While in juvenile detention, Vinny’s older brother, David, age 19, is incarcerated in the adult county jail for the first time in 2012. He has since been incarcerated eight times for aggravated assault, for which he was deemed not guilty; distribution of marijuana; and car theft. David, who was introduced to drug dealing at age ten by his father, has been in and out of juvenile and adult correctional settings. Since 2012, David has been under government surveillance programs, including the pretrial system and probation.After being separated from his family by the courts from 2012 through 2014, Vinny left his aunt’s house in Northern New Mexico. He moved move in with his brother, Felicia, David’s girlfriend, and their two children, dreaming of a renewed family. Vinny, now 19, has a 2-year-old daughter named Jordyn. Vinny and David have grown up in an environment of loss and violence yet yearn for love and connection. In the midst of turmoil, Vinny and David try to embrace their youth. Vinny describes David as a father figure, and David views Vinny as the only person who appreciates him. Vinny, age 14, and David, age 20, stand at the top of a mountain in Northern New Mexico before a summer storm, 2013. Vinny, age 13, cries as he sits in the juvenile detention center in Albuquerque, New Mexico, 2012. Vinny, age 13, cries during a visit with his mom, Eve, at the juvenile detention center. He says, “get me out mom, just get me out,” 2012. Vinny, age 13, walks with hands up as boys march in a circle inside the gym at the juvenile detention center, 2012. Vinny, age 13, eats his first meal in the detention center cafeteria, 2012. Vinny, age 13, prays inside his cell at the juvenile detention center, 2012. Eve, age 43, cries after receiving a phone call that the juvenile court recommends that Vinny be placed in foster care, 2012. 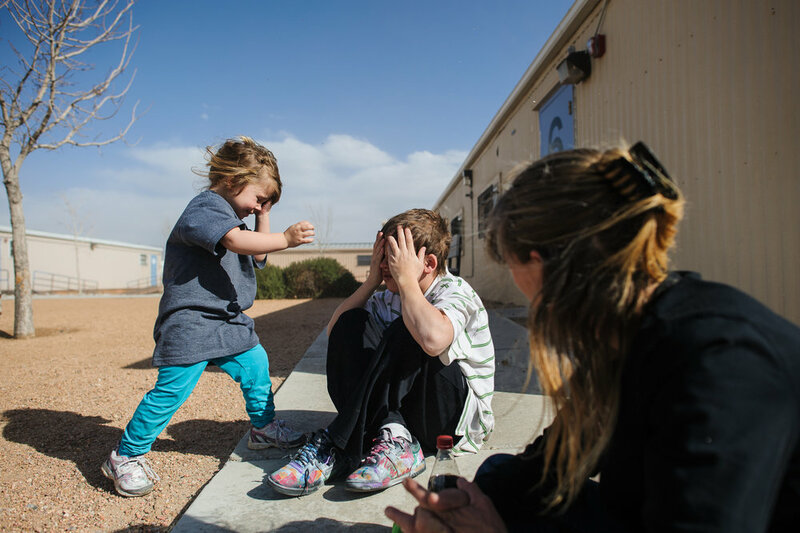 Vinny, age 13, plays a game with his sister, Elycia, age 4, outside the counseling office where he will be evaluated for post traumatic stress, 2012. Elycia is breastfed, as Eve sleeps, 2012. Eve holds her youngest son, Michael, in the pool at the motel, 2013. Michael, age 7, playfully punches his sister Elycia’s cheek, 2012. Vinny, age 13, pulls Elycia in a wheelbarrow during a family visit, 2012. Vinny, age 13, lies on a blanket with his mom, Eve, as she sleeps in the backyard of his aunt’s home during an organized family visit, 2012. David, age 19, kisses Felicia, age 19, on the cheek in the motel room where they are residing, 2012. Vinny punches trashcans behind his aunt’s home, 2012. 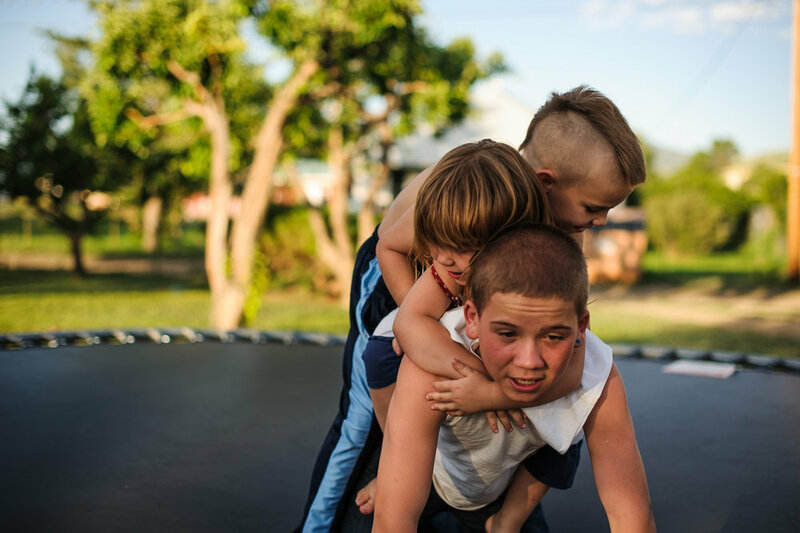 Vinny, age 13, carries his sister and brother on his back on a trampoline at his aunt’s home during an organized family visit, 2012. A cherished family portrait of David, then 13, Vinny, then 8, and Michael, then 3. Vinny, age 13, sprays David, age 19, with a hose, 2012. Eve, age 43, rests her head on David, age 19, back, as he draws a clown in a notebook, 2012. David, age 19, cries because he found that he has a warrant and fears that the police will arrest him, 2012. David, age 19, sits in the recreation yard at the Metropolitan Detention Center in Albuquerque, 2012. 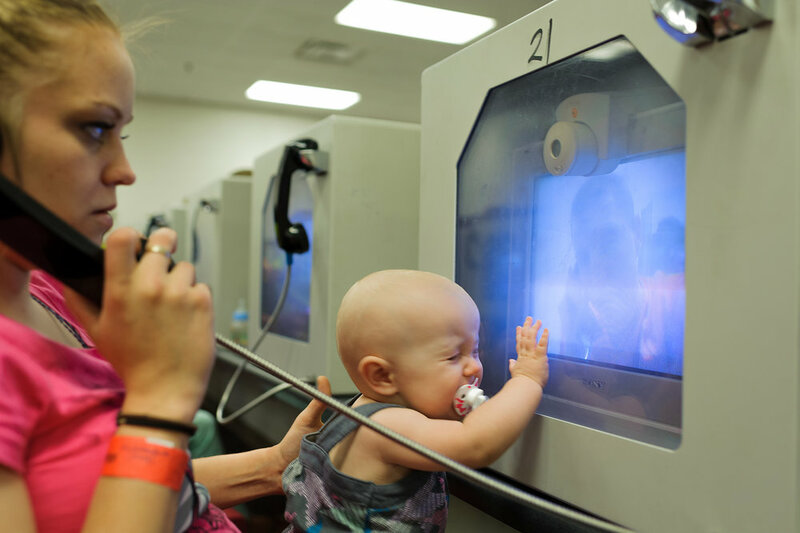 Felicia, age 20, and Lily, age 10 months, see David, age 20, through video visitation at the county jail, 2013. David, age 19, calls Felicia from inside the Metropolitan Detention Center in Albuquerque, 2012. David, age 21, and Felicia, age 21, in their bedroom, 2014. David, age 20, kisses Lilly, age 8 months, on her head, 2013. David, age 21, comforts Vinny, who found an object he made for Krystle split in half, 2014. David, age 21, looks at Vinny, age 15, as he smokes a cigarette on the bed, 2014. Vinny, age 15, and David, age 21, tease each other while Vinny showers, 2014. David, age 21, feeds Mary Jane, age 4 months, before his trial, 2014. Michael, age 7, rides a bike at night, 2012. Michael, age 7, points a flash light at his dad, Eddie’s, face during a family visit inside David’s motel room, 2012. Mark, Eve’s boyfriend, holds his hand up, as Eve reacts, while they wait in the hospital after Mark was stabbed by Eddie, Eve’s ex-husband, in a jealous rage, 2012. Eve puts clothes on hangers, as Mark, her boyfriend, lies behind her on their bed, 2015. Vinny, age 16, and Elycia, age 7, watch the sunset behind Interstate 40 from the motel parking lot, 2015. Vinny, age 15, and David, age 21, laugh, 2014. David, age 21, shaves his dad, Dave’s, head before David’s trial, 2014. Vinny, age 16, tickles Michael, age 10, while Krystle rests her head on Vinny’s back; Eve sits with Elycia on the right side of the bed during a visit at Eddie’s motel room where Elycia and Michael live, 2015. David, age 25, stands outside his mother’s trailer at night before going to sell drugs, 2018. Vinny, age 18, holds his mom, Eve, and kisses her on the head after he is acquitted of punching his friend, who had hit his girlfriend’s nephew, 2017. Vinny, age 18, and Krystle, age 33, kiss on the bed at his friend’s motel room as a family friend smokes pot beside them, 2017. Vinny, age 18, grills meat while a family friend, Jerry, prepares the lunch table in the recreation area of the apartment complex where Jerry lives, 2017. Vinny, age 18, lies on the floor with his daughter Jordan, age 1, 2017. Vinny, age 18, and his daughter Jordyn, age 1, gather at the balloon fiesta in Albuquerque, 2017. Vinny, age 18, holds his daughter Jordyn’s face as they prepare for an outing, 2017. Jordyn, age 2, stands in the doorway of Eve’s trailer, 2018.